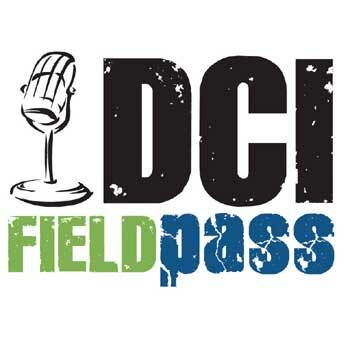 The Field Pass with DCI's Dan Potter is a half-hour audio magazine featuring the performers, designers, instructors and fans of the world's top drum corps. Season on! Grab your Field Pass and let's go to the stadium! Contents of The Field Pass, Vol. 5 – July 28: This week on the Field Pass with Dan Potter: Phantom Regiment is "On The Field" -- they're our corps of the week. We'll hear from Phantom's director Pat Seidling about PR's use of amplification this year, and Regiment guard member John Owen talks about his portrayal of Gene Kelly. We begin a two-part miniseries on life as a drum corps first-timer, "One Rookie's Story." Meanwhile, rookie drum corps parents reveal what it's like for them. And, in our Box 5 salute to excellence, the Mandarins drum corps evolution. Dan Potter is well-known to DCI fans as a frequent field announcer. If you're a Season Pass subscriber, login and look under the Summer Coverage pull-down menu. Remember when. Live it now. One pass. One place.